Civil Aviation Minister Ajit Singh could not have made his stand on the fate of sacked IPG pilots more clear. On a day when the pilots of the de-recognised Indian Pilots Guild approached the Air India chairman, pleading for opening up of a channel of communication, and held a �peace march�, a tough- taking minister made it absolutely clear that �terminated� pilots would have to apply afresh if they want to come back. 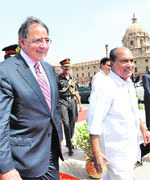 Worried over United States� new defence focus on Asia, New Delhi today told Washington to re-calibrate its strategy, as India fears that it could lead to increased militarisation of its neighbourhood. 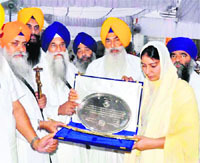 The Sikh high priests today bestowed the title of �Zinda Shaheed� (living martyr) on Balwant Singh Rajoana, convicted for the assassination of former Chief Minister Beant Singh, on the occasion of the 28th anniversary of Operation Bluestar at the Akal Takht here. Facing criticism over the economic downturn, Prime Minister Manmohan Singh today acknowledged that the country was running into more turbulent waters with rising demand and supply bottlenecks leading to inflationary pressure. The Delhi High Court today issued notice to the Centre on a PIL seeking action against Google India and Facebook India for alleged evasion of Income Tax and non-verification of users. A combination of factors, including arrival of the monsoon, hopes of further rate cuts by the RBI and firm global markets on the back of a possible monetary stimulus for Europe, powered the single biggest rally in the stock markets since January 3 this year.